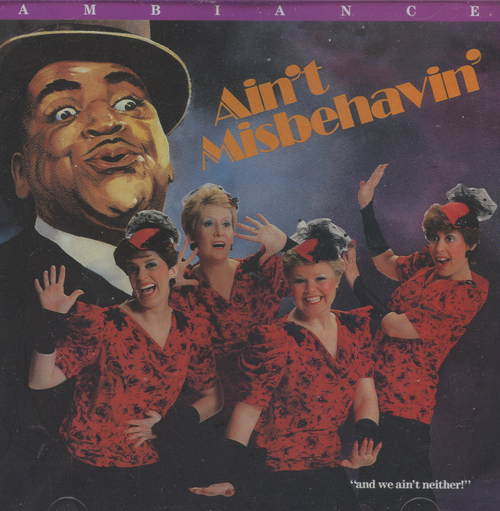 "Ain't Misbehavin'" was recorded in 1986, just after Ambiance won the Sweet Adelines championship, and features many of arrangements that were part of their repertoire at that time. Vintage material, including several Fats Waller compositions from the era of jump and stride, dominate, recognizing the stylistic contributions of jazz and blues to barbershop. Whether the old-fashioned sentimentality of "No One Loves You Better Than Your M-A-DOUBLE M-Y," "I Never Knew - I Could Love Anyone Like I'm Loving You" and "Handful of Keys" - sung with lightening bolt energy - or the slower ballads, "I've Got A Feeling I'm Falling," and "All By Myself," which are conjugated with laserlike focus, Ambiance combines passion with incredible chops.